A shy schoolmaster finds love with a stage actress who helps bring him to greatness as a teacher, ultimately earning him the respect and admiration of his students and peers. Musical remake of the 1939 classic. 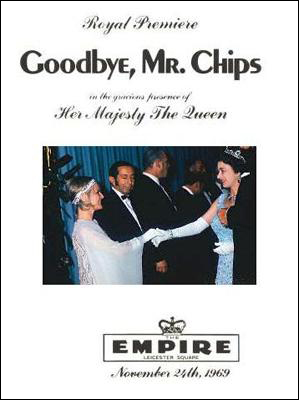 Based on the novel by James Hilton. "Main Titles/Fill the World With Love"
"Where Did My Childhood Go?" "Entr'Acte/What Shall I Do With Today?" What A Lot of Flowers"
"What A Lot of Flowers (Reprise)"
"And the Sky Smiled (Reprise)"
"Fill the World With Love (Reprise)"
"Exit Music - You and I"
For the new version, the wife has been made a West End musical-comedy actress, which gives Petula Clark a reason for playing it. I think I'm in love with her. If she had come along twenty years ago, a time the screen knew a mercurial presense when it saw one, she would have been a much bigger star than she ever has a chance of being now. The playing is superb. Peter O'Toole is a prim and angular Chips who wears a look of permanent insecurity; Miss Clark is a soft, sweet-smelling, dimpled doughnut with powdery cheeks and witty anxiety, like a new Jean Arthur. 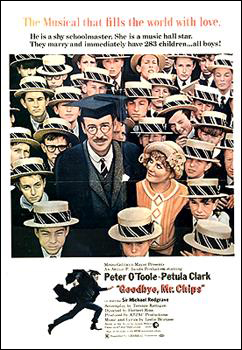 Together they are perfect counterparts. . .Goodbye Mr. Chips is, I'm afraid, very square indeed, but thanks to an idyllic ast and a magnificent director, there is so much love and beauty in it that it made my heart stop with joy. I found it all quite irresistible. Petula Clark, in an expansion of the Greer Garson role, also contributes grace and intelligence to the production. 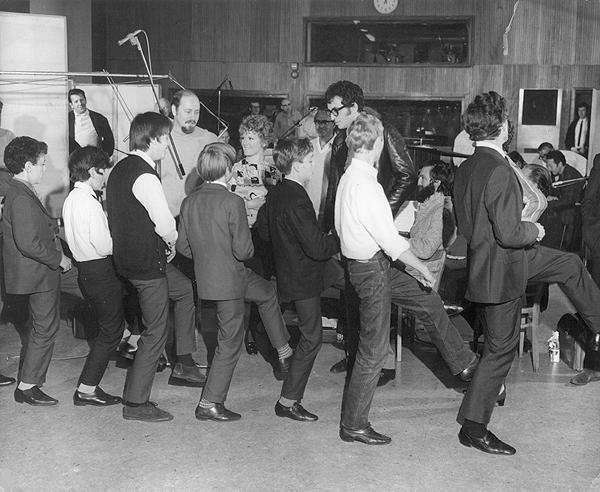 Rarely have a pair of players been so marvelously in turn with each other as Peter O'Toole and Petula Clark. 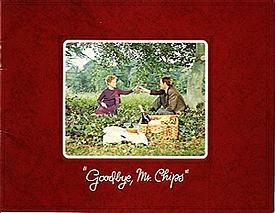 Goodbye Mr. Chips, at the Palace, has been produced in England in surroundings of inevitable authenticity and taste, with performers of extraordinary talent and range, and the results are here for all of us to share the sentimental warmth. Peter O'Toole give one of his very best performances as the repressed professor, and Petula Clark goes to town in the other direction as the actress-singer who really wants to lead another kind of life. This is a pictures which, if you will concede the value and interest of subject and story, could hardly have been made into a more appealing picture. I enjoyed it and I was far from prejudiced in its favor. That O'Toole performance is a gem, and Petula Clark knows exactly how to enhance its brilliance, and her own, most effectively. Petula Clark brings spontaneity, charm and a refreshing ingenue quality that belies her age. And what of Petula Clark? She is wonderful. Clark plays Catherine as though she is coming from just the other direction as Chips. Outwardly gay and devil-may-care, she is really someone who wants nothing to do with glamour. but would love to settle down and have a family. "My real name is Briskit," she tells Chips in Pompeii, to which he answers secretly delighted, "A good Anglo-Saxon name." As Clark plays Catherine she is both earth mother and Mother England all rolled up in one. (She actually appears as the seated Brittania early in the film. What is most remarkable about Petula Clark's portrayal of Catherine is that she becomes Catherine, a Catherine who loves her husband more than anything else. Everytime she looks at Chips we see love. It would be interesting to learn how o'Toole and Clark got along during the filming, for if they didn't like each other they immediately must be nominated for every acting award available.) The pride Catherine feels for Chips. . .the devotion. . . are tangible things. This is real. As played by Petula Clark, Catherine is the woman every man dreams of marrying which makes her perfect for the dumb-founded at his good luck Chips.